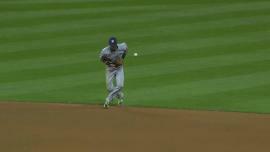 Jason Heyward singles on a ground ball to shortstop Yadiel Rivera. Addison Russell grounds out, third baseman Hernan Perez to first baseman Adam Lind. Starlin Castro doubles (19) on a soft fly ball to second baseman Scooter Gennett, deflected by right fielder Shane Peterson. 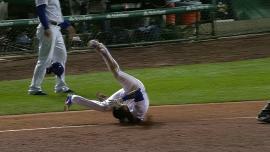 Anthony Rizzo to 3rd. December 31, 2018 LHP Cesar Jimenez transferred to Leones del Caracas from Aguilas del Zulia. October 7, 2018 LHP Cesar Jimenez assigned to Aguilas del Zulia. January 30, 2018 LHP Cesar Jimenez assigned to Venezuela. October 4, 2016 LHP Cesar Jimenez assigned to Cardenales de Lara. January 22, 2016 Milwaukee Brewers signed free agent LHP Cesar Jimenez to a minor league contract and invited him to spring training. November 3, 2015 LHP Cesar Jimenez elected free agency. 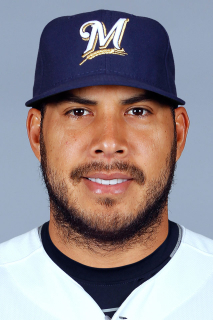 November 2, 2015 Milwaukee Brewers sent LHP Cesar Jimenez outright to Colorado Springs Sky Sox. August 22, 2015 Milwaukee Brewers activated LHP Cesar Jimenez. August 21, 2015 Milwaukee Brewers claimed LHP Cesar Jimenez off waivers from Philadelphia Phillies. August 21, 2015 Philadelphia Phillies designated LHP Cesar Jimenez for assignment. August 12, 2015 Philadelphia Phillies selected the contract of LHP Cesar Jimenez from Lehigh Valley IronPigs. April 13, 2015 Philadelphia Phillies sent LHP Cesar Jimenez outright to Lehigh Valley IronPigs. April 12, 2015 Philadelphia Phillies designated LHP Cesar Jimenez for assignment. April 4, 2015 Philadelphia Phillies selected the contract of LHP Cesar Jimenez from Lehigh Valley IronPigs. February 9, 2015 Philadelphia Phillies sent LHP Cesar Jimenez outright to Lehigh Valley IronPigs. January 29, 2015 Philadelphia Phillies designated Cesar Jimenez for assignment. October 9, 2014 LHP Cesar Jimenez assigned to Cardenales de Lara. August 1, 2014 Philadelphia Phillies selected the contract of LHP Cesar Jimenez from Lehigh Valley IronPigs. June 8, 2014 Philadelphia Phillies sent LHP Cesar Jimenez outright to Lehigh Valley IronPigs. June 6, 2014 Philadelphia Phillies designated LHP Cesar Jimenez for assignment. June 1, 2014 Philadelphia Phillies selected the contract of LHP Cesar Jimenez from Lehigh Valley IronPigs. April 20, 2014 Lehigh Valley IronPigs activated LHP Cesar Jimenez from the temporarily inactive list. April 17, 2014 Lehigh Valley IronPigs placed LHP Cesar Jimenez on the temporarily inactive list. March 30, 2014 LHP Cesar Jimenez assigned to Lehigh Valley IronPigs. November 15, 2013 Philadelphia Phillies signed free agent LHP Cesar Jimenez to a minor league contract and invited him to spring training. November 7, 2013 LHP Cesar Jimenez assigned to Cardenales de Lara. October 24, 2013 LHP Cesar Jimenez elected free agency. October 16, 2013 Philadelphia Phillies sent LHP Cesar Jimenez outright to Lehigh Valley IronPigs. August 6, 2013 Philadelphia Phillies selected the contract of Cesar Jimenez from Lehigh Valley IronPigs. December 5, 2012 Philadelphia Phillies signed free agent LHP Cesar Jimenez to a minor league contract and invited him to spring training. October 4, 2012 LHP Cesar Jimenez elected free agency. August 24, 2012 Tacoma Rainiers activated LHP Cesar Jimenez from the 7-day disabled list. August 13, 2012 sent LHP Cesar Jimenez on a rehab assignment to AZL Mariners. June 18, 2012 Tacoma Rainiers placed LHP Cesar Jimenez on the 7-day disabled list. March 22, 2012 Seattle Mariners sent LHP Cesar Jimenez outright to Tacoma Rainiers. September 1, 2011 Seattle Mariners selected the contract of Cesar Jimenez from Tacoma Rainiers. March 29, 2011 Seattle Mariners sent Cesar Jimenez outright to Tacoma Rainiers. November 19, 2010 Seattle Mariners selected the contract of Cesar Jimenez from West Tenn Diamond Jaxx. October 8, 2010 LHP Cesar Jimenez assigned to Cardenales de Lara. August 14, 2010 Cesar Jimenez assigned to West Tenn Diamond Jaxx from AZL Mariners. July 30, 2010 Cesar Jimenez assigned to AZL Mariners. October 29, 2009 Seattle Mariners sent LHP Cesar Jimenez outright to Tacoma Rainiers. July 8, 2009 AZL Mariners sent LHP Cesar Jimenez on a rehab assignment to Tacoma Rainiers. June 21, 2009 Cesar Jimenez assigned to AZL Mariners. May 26, 2009 Cesar Jimenez roster status changed by Seattle Mariners. April 24, 2009 Seattle Mariners sent LHP Cesar Jimenez on a rehab assignment to Tacoma Rainiers. April 1, 2009 Seattle Mariners placed LHP Cesar Jimenez on the 15-day disabled list retroactive to March 29, 2009.